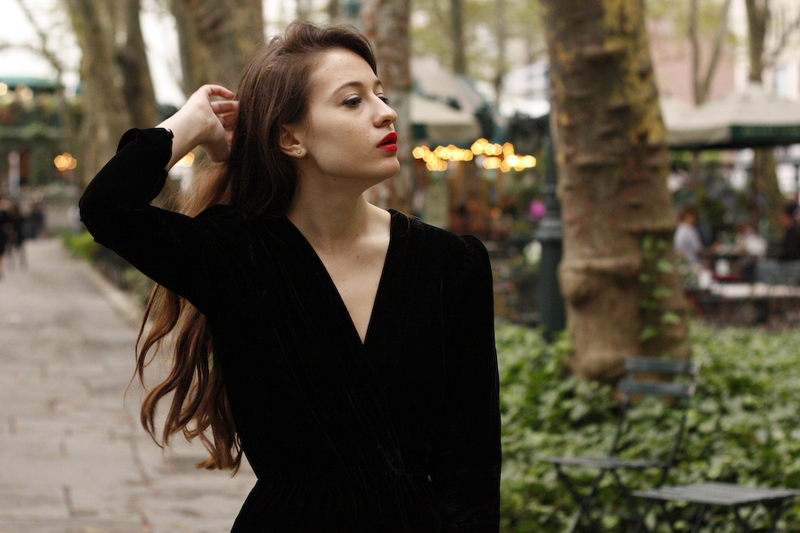 Never in my life have I been so relieved that I packed a velvet onsie as I was yesterday. My stay in NY has consisted of a series of california girl clothes that are not suitable for the gross wet weather of NY that left me cold and wet, or in some sort of itchy pain. This was the perfect piece to wear for a day of fashion shows and shopping! I have to admit though, the glittery stripper shoes are the definition of pain! I think I made it about 2 blocks before resorting to the sweet comfort of flats. Here's a quick summary of what I've been doing in NY the past few days: visited Coach headquarters & got to meet some of the hottest ladies on the interweb while at dinner at Hotel Griffou, accidentally walked into Agent Provocateur's presentation and died of amazement, seen 4 shows at the tents (will post photos later), worked till 2 am on FNO, attended the Metal Magazine party, middle of the night trip to brooklyn for guaco tacos, had an amazing selection of foods at various places in soho, learned how to use the subway on my own, vintage shopping in the lower east side, and and found my dream newsstand that carries any and every magazine I've ever wanted. As much as I've had fun here, I miss everyone in LA and my car! Now I'm off to grab a bite and head to the tents!